Passport check, ticket check, GoPro check, rucksack check, ...... Marcella and I on our way to a four days scuba diving trip to Pulau Sipadan, dubbed one of the five most spectacular diving sites in the world. We travelled to the fishing village of Semporna on the eastern tip of Borneo. From there a boat took us to the Seaventures Dive Rig (until 1985 used to house oil company personnel off the coast of Labuan). This is the only decommissioned off- shore rig in the world converted for scuba diving. When we arrived underneath the rig, a hydraulic platform elevator brought us up to the main deck nine meters above the water level. Selamat datang!! It still had the feeling of a working oil platform: a whiff of the sweet smell of diesel, the hum of the power generator, metal staircases leading to the old crew quarters converted to our tiny cabins, steep outboard walkways to get to the upper decks and everywhere weather-worn steel structures. Each morning at 06:00 we left the rig on an eight-meter-long glass-fibre speedboat. 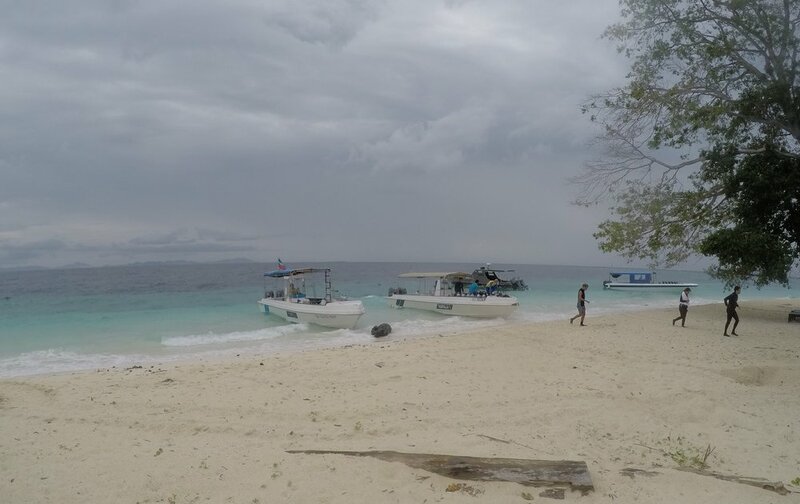 The engines roared and on a choppy opaque gray sea we reached Sipadan Island after 40 bumpy minutes. This secluded coral island is the top of a 600-meter-high seamount on the bottom of the Celebes Sea. It has a one kilometre circumference, coconut palm trees, four wooden shelters, toilet facilities and a small make-shift army tent camp. We jumped off the boat onto the beach and saw fresh turtle tracks from the egg laying in the night. At a wooden office (which issues maximum 120 diving permits each day) we registered. "Stay always close to me," Helmi our divemaster pointed out to us, "because the currents can push you up and down or even out into the ocean when you don't expect it." The boat dropped us a few hundred meters from the beach where the coral reef drops vertically into the depth of the ocean. With strong currents around the island we drift-dived along a wall full of colourful coral, floating weightlessly above the looming total blackness of the deep abyss. We were one with a serene world, a slow-motion world, commanding our respect. The abyss looked scary, sometimes showing shadows of big fish swimming deep below. I floated along the reef and as I turned my back saw a turtle gently swimming next to me: woow, magic to swim shoulder to shoulder with a one-meter-long green-turtle! Marcella and I communicated without talking and saw the plankton being pushed up from the deep ocean floor. The sound of our air bubbles rising to the surface was soothing. Marcella spotted the shadows of a manta ray, alas only a few seconds. Looking up we gazed at shoals with thousands of jackfish silhouetting against the air. We swam just a few meters from a spiralling formation of torpedo shaped barracuda’s, making me feel very small. I had never seen so many fish in one spot (and I mean a lot, more than in the Red Sea, more than in the Maldives...). Watching this underwater world drift by was a humbling experience. I checked my air pressure (you do not want to run out of air down there!) and the dive computer showed depth’s up to 29 meters with balmy 28 C temperatures. At Barracuda Point, South Point, Hanging Gardens and White Tip Avenue we did ten dives in three days. After each dive the boat picked us up where we surfaced (we signalled the captain with our red surface marker buoy) and took us to the beach for a one-hour rest and some tea, fresh fruits and crackers. Oh, did I mention the underwater-panda-bears? Here is a tip for you if you ever dive with Chinese people: be prepared to see them wear the most ridiculous panda bear shaped dive caps!!!! In the late afternoons we returned to the rig. Great company with fellow divers (Chinese, Korean, Swedish and British) unwinding on the main deck and swapping story’s about what we saw and didn’t see. Many happy faces. I am always amazed how experiencing spectacular events somehow brings people together. As for Marcella and myself, we enjoyed a cold frothy Tiger Beer and watched shoals of silver-shining fish jumping out of the water, a turtle carried by the current and shoals of two-meter-long pipefish around the rig. A few boats with scuba divers passed by. The fishermen on the nearby island of Mabul returned to their stilt houses before the night set in. Unfortunately there was the plastic trash floating past the rig coming from the mainland. Speaking of environmental damage, on a white board on the main deck the divemasters recorded where and when they heard illegal dynamite fishing in the area! This was reported to the authorities, but has been a persistent problem for many years. Let’s hope, - dare I say it? -, we will be able to protect these pristine waters! Impossible not to see the many security precautions taken to protect the people against pirate attacks. A Malaysian navy ship anchored 500 meters from the rig and police patrol boats plied the waters between the islands. Just before sunset, while we were enjoying our dinner on the main deck, five policemen, wearing bulletproof vests marked 'Polis' and carrying automatic rifles, came on board to keep guard until the next morning. Pirates (or in the media they are called Abu Sayyaf terrorists) live on the nearby Philippine islands only one hour by boat away. The locals were worried about this constant threat. "They infiltrated the population of some of our own islands and it is difficult to know who we can trust around here…." a local murmured. Still, at all times Marcella and I felt very safe and looked after. At the risk of sounding trite, diving was spectacular. Not only the sheer numbers of fish was impressive; so many different shapes and colours of fish all attracted by those currents Helmi pointed out us. Add the bumpy boat rides, the accommodation on the rig reminiscent of a working oil platform and the challenging ocean currents, you will agree that this was a really off the beaten track adventure. So unique and special. 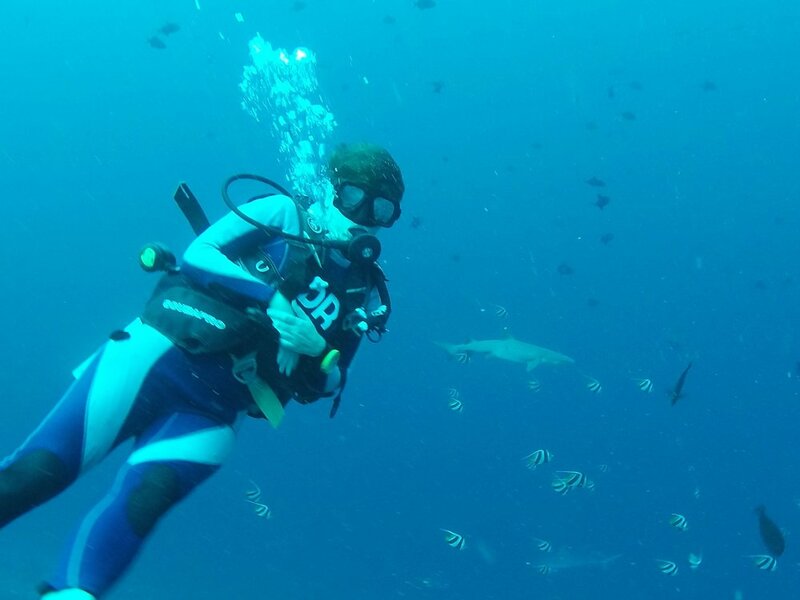 Marcella and I felt privileged to dive in what must be one of the most spectacular marine habitats on earth!! Older PostChina - so different!